Looking for a fun and informative class for beginners or advanced students? This course adheres to the individual. Students in this class will be given the opportunity to explore and develop their own style and pace, as well as having the freedom to choose their own subject. No prior experience is necessary. Technical skills for oil painting will be taught as a part of the art process. Students will be introduced to: impasto, alla prima, old masters, impressionism, pointillism, perspective, color theory, composition and design, etc. Students will be encouraged to present their art to the public and will receive training on how to market their talent. Beginners sometimes find the work of the existing students to be a bit intimidating. 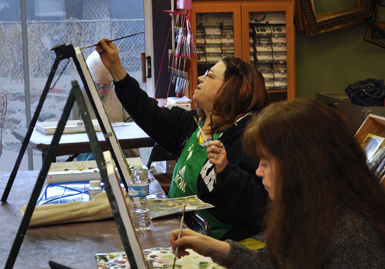 Please be assured that even the most experienced painter started at the beginning; and Linda’s classes are the best place to do that! In addition to Linda’s expert coaching, instruction and guidance, fellow students are always warm and encouraging. You can rest assured that everyone here wants you to be successful!